New Delhi: Over 2000 students across India are expected to participate in pan-India competition, FIRST LEGO League India kick starting from 13th January 2018. 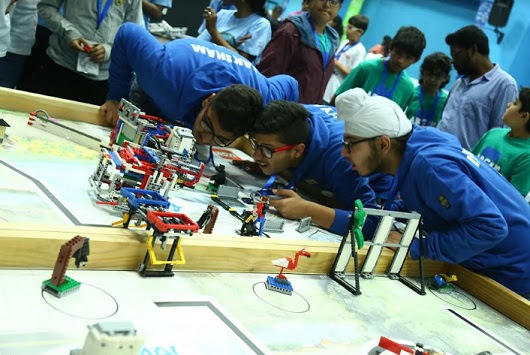 Organized by India Stem Foundation, the objective of the competitions is to provide a platform to inspire students to discover exciting career possibilities in STEM and learn to make a positive contribution to society. The competitions will be held in eight different cities namely Delhi-NCR, Kolkata, Bangalore, Chennai, Ahmedabad, Coimbatore, Mumbai and Hyderabad at regional levels. The regional competitions will conclude with a Grand National Championship on 10-11 February 2018 at Velammal Bodhi Campus, Chennai. The winning teams at the National Championship will represent India among over 80 countries in the International Championships to be held at USA, Hungary and Estonia. FIRST LEGO League is a unique STEM based robotics competition for students of age group 9 to 16 years that immerses children in the real-world science & technology challenges through a fun-filled exploration journey. Students in a team of 2-10 members research and design their own solution to a current real-world scientific question or problem. They also build and program autonomous robots that perform a series of missions while improvising their valuable 21st Century skills or life skills. Centered on the theme, HYDRODYNAMICS, the event will witness students exhibiting their innovative solutions for Human Water Cycle related issues. “Skills sets are rapidly evolving in India and elsewhere. According to a report from FICCI-NASSCOM; By 2022, over a third of India’s workforce will be in jobs requiring new skills. To enable the young generation to be competent for the roles requiring radically different skill sets, it is essential to introduce students to the world of science and technology at an early age through such platforms. These platforms will go a long way in honing requisite STEM skills among students in a fun-filled way besides equipping them for a better future. It is also important to mention that support from like minded organizations is quintessence for the program’s success. ISF is privileged & thankful to Rockwell Automation India, FORD Motors India & Velammal Bodhi School for their support to current FLL India season.” said Sudhanshu Sharma, CEO and Director, India STEM Foundation. FIRST LEGO League India was launched in 2009 and since then, over 1000 teams have participated in the competition. Teams that qualified at National have represented India & won accolades for their strategy & design, research & innovation and team work at multiple International Championships such as World Festival at USA, Asia-Pacific Championship at Australia, European Open Championship, and International Open Championship.